We are a standout organization in the field of manufacture, supply, trade, distribute, retail, wholesale and import of Bulk SMS GSM Modems. The offered range comprises of 8 Port SMS Modem Pool, 16 Port Modem Pool, 32 Port Modem Pool, 64 Port Modem Pool and Bulk SMS 32 Port Modem Pool with audio option and without audio option. We have developed the entire range of these modems using the best quality components procured from our genuine industry vendors. Just like 32 single-channel equipments work at the same time. 32 SIM card slots, support 32 SIM cards(big or small support). Connection to your computer through via USB data cable(ONLY USB INTERFACE). Each channel with separate power switch. Each individual module be demolished. Industrial class modules, elegant shell. GSM frequency: 900/1800 MHz or 900/1800/1900mhz or 850/900/1800/1900MHz optional. Wireless access to internet. Comply with GSM phase2 standard. Support sending& receiving bulk SMS,MMS,USSD,STK. Support Open AT commands. Build in 32 GPRS modem in one box. Single power supply for 32 modems. Power button to control on and off. USB interface. Dual Band: 900/1800Mhz. Tri Band: 850/1800/1900MHz, or 900/1800/1900Mhz. Quad Band EGPRS 850/900/1800/1900 Mhz. 21.4kbps uplink / 85.6 kbps downlink. 42.8 kbps uplink / 68.2 kbps downlink. Voice Call through mobile network. Full duplex and half duplex rate. Double sound multi- frequencies function (DTMF). CSD up to 18.8 kbps. GPRS Modem Pool main unit. Just like 8 single-channel equipments work at the same time. 8 SIM card slots,support 16 SIM cards(big or small support). Connection to your computer through via USB data cable(ONLY USB INTERFACE). Each channel with separate power switch. Each individual module be demolished. Industrial class modules, elegant shell. GSM frequency: 900/1800 MHz or 900/1800/1900mhz or 850/900/1800/1900MHz optional. Wireless access to internet. Comply with GSM phase2 standard. Support sending& receiving bulk SMS,MMS,USSD,STK. Support Open AT commands. Build in 8 GPRS modem in one box. Single power supply for 8 modems. Power button to control on and off. USB interface. »» Support Windows. Linux. UNIX OS. 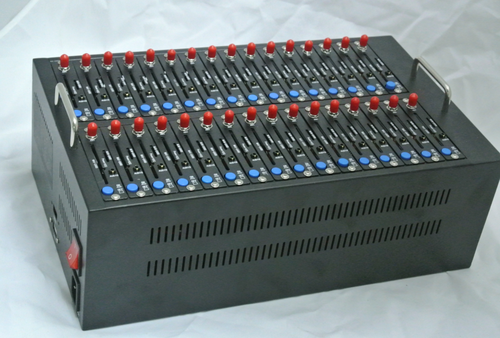 Just like 16 single-channel equipments work at the same time. 16 SIM card slots,support 16 SIM cards(big or small support). Connection to your computer through via USB data cable(ONLY USB INTERFACE). Each channel with separate power switch. Each individual module be demolished. Industrial class modules, elegant shell. GSM frequency: 900/1800 MHz or 900/1800/1900mhz or 850/900/1800/1900MHz optional. Wireless access to internet. Comply with GSM phase2 standard. Support sending& receiving bulk SMS,MMS,USSD,STK. Support Open AT commands. Build in 16 GPRS modem in one box. Single power supply for 16 modems. Power button to control on and off. USB interface. We are a reliable and prestigious organization in the field of manufacture, supply, trade, distribute, retail, wholesale and import of 16 Port Modem Pool. There is a unique range of these port modems available with us for the purpose of supplying these to large client base. These modem pools are in compliance with the GSM Phase 2 standard. Apart from this, these 16 port modem pools are available at suitable prices. Industrial design Aluminum casing Wireless access Modem for sending Bulk SMS. Wavecom Q2403A, Q2403B, Q2406A, Q2406B, & Q24 Plus chipset modem with original registered IMEI no. 16 port modem is capable of sending 15000 SMS per hour. Being quality oriented organization, we are involved in the field of manufacture, supply, trade, distribute, retail, wholesale and import of 8 Port SMS Modem Pool. Highly acclaimed among the client base, these modem pools are available in customized versions on the demand of the client base. These modem pools could efficiently operate on the windows platform such as windows xp, windows vista, windows 7, etc. We offer these 8 port sms modem pools at leading market prices to the clients. Industrial design Aluminum casing Wireless access Modem for sending Bulk SMS. Wavecom Q2403A, Q2403B, Q2406A, Q2406B & Q24 Plus chipset modem with original registered IMEI no. 8 port modem is capable of sending 7500 SMS per hour. Backed by our rich industry experience, we are manufacturing, supplying, trading, distributing, retailing, whole selling and importing 32 Port Modem Pool. We have huge stock of these port modem pools to cater to the requirements of the ever-increasing client base. These could run on the windows 7, Windows Vista, Windows XP, etc. These are in compliance with the GSM or GPRS standards. These have the facility to accommodate 8 Sim Cards. Furthermore, these port modem pools are available to the clients at leading market prices. Industrial design Aluminum casing Wireless access Modem for sending Bulk SMS. Wavecom Q2403, Q2406 & Q24 Plus chipset modem with original registered IMEI no. you can send 30000 SMS per hour in 32 port modem. Packaging Details: Own by unitech. We are highly appreciated and an eminent organization in the field of manufacture, supply, trade, distribute, retail, wholesale and import of 64 Port Modem Pool. The diverse pool of these port modem pools are fabricated in accordance with the laid industry parameters and has power button to control on or off. Designed to be used for long period of time, these port modem pools could easily operate on WAP, MMS, SMS and voice applications. Moreover, these port modem pools are available at competitive prices.